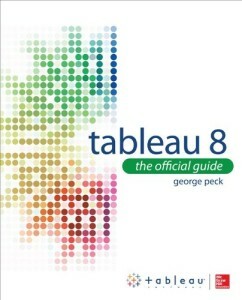 A while back I reviewed Larry Keller’s book The Tableau 8.0 Training Manual, at the same time I ordered George Peck’s book Tableau 8: the official guide. It’s just arrived. The book comes with a DVD containing bonus videos featuring George Peck’s warm, friendly tones and example workbooks. I must admit to being mildly nonplussed at receiving optical media, my ultrabook lacking an appropriate drive, but I dug out the USB optical drive to load them up. Providing an online link would have allowed the inclusion of up to date material, perhaps covering the version 8.1 announcement. Tableau is a data visualisation application, aimed at the business intelligence area and optimised to look at database shaped data. I’m using Tableau on a lot of the larger datasets we get at ScraperWiki for sense checking and analysis. Colleagues have noted that analysis in Tableau looks like me randomly poking buttons in the interface. From Peck’s book I learn that the order in which I carry out random clicking is important since Tableau will make a decision on what you want to see based both on what you have clicked and also its current state. To my mind the heavy reliance on the graphical interface is one of the drawbacks of Tableau, but clearly, to business intelligence users and journalists, it’s the program’s greatest benefit. It’s a drawback because capturing what you’ve done in a GUI is tricky. Some of the scripting/version control capability is retained since most Tableau files are in plain XML format with which a little fiddling is tacitly approved by Tableau – although you won’t find such info in The Official Guide. I’ve been experimenting with using git source control on workbook files, and it works. If you’re interested in these more advanced techniques then the Tableau Knowledgebase is worth a look. See this article, for example, on making a custom colour palette. I also like the Information Lab blog, 5 things I wish I knew about Tableau when I started and UK Area Polygon Mapping in Tableau. The second post covers one of the bug-bears for non-US users of Tableau: the mapping functionality is quite US-centric. Peck covers most of the functionality of Tableau, including data connections, making visualisations, a detailed look at mapping, dashboards and so forth. I was somewhat bemused to see the scatter plot described as “esoteric”. This highlights the background of those typically using Tableau: business people not physical scientists, and not necessarily business people who understand database query languages. Hence the heavy reliance on a graphical user interface. I particularly liked the chapters on data connections which also described the various set, group and combine operations. Finally I understand the difference between data blending and data joining: joining is done at source between tables on the same database whilst blending is done on data from different sources by Tableau, after it has been loaded. The end result is not really different. I now understand the point of table calculations – they’re for the times when you can’t work out your SQL query. Peck uses different language from Tableau in describing table calculations. He uses “direction” to refer to the order in which cells are processed and “scope” to refer to the groups over which cell calculations are performed. Tableau uses the terms “addressing” and “partitioning” for these two concepts, respectively. Peck isn’t very explicit about the deep connections between SQL and Tableau but makes sufficient mention of the underlying processes to be useful. It was nice to see a brief, clear description of the options for publishing Tableau workbooks. Public is handy and free if you want to publish to all. Tableau Online presents a useful halfway house for internal publication whilst Tableau Server gives full flexibility in scheduling updates to data and publishing to a range of audiences with different permission levels. This is something we’re interested in at ScraperWiki. The book ends with an Appendix of functions available for field calculations. In some ways Larry Keller and George Peck’s books complement each other, Larry’s book (which I reviewed here) contains the examples that George’s lacks and George’s some of the more in depth discussion missing from Larry’s book. Overall: a nicely produced book with high production values, good but not encyclopedic coverage.